It was as important for what it gets right as for what it misses. In 2002, I heard an economist characterizing this figure as containing a valuable economic insight. He wasn’t sure what the insight was. I have my own answer. The economist talked of the figure as a sort of treasure map, which would lead us to the insight. “X” marks the spot. Dig here. This figure tells three stories. First, we see two distinct historic periods since World War II. In the first period, workers shared the gains from productivity. In the later period, a generation of workers gained little, even as productivity continued to rise. The second message is the very abrupt transition from the post-war historic period to the current one. 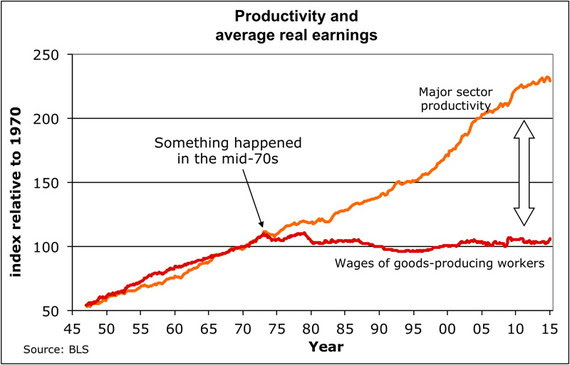 Something happened in the mid-70’s to de-couple wages from productivity gains. The third message is that workers’ wages – accounting for inflation and all the lower prices from cheap imported goods – would be double what they are now, if workers still took their share of gains in productivity. This de-coupling of wages from productivity has drawn a trillion dollars out of the labor share of GDP. 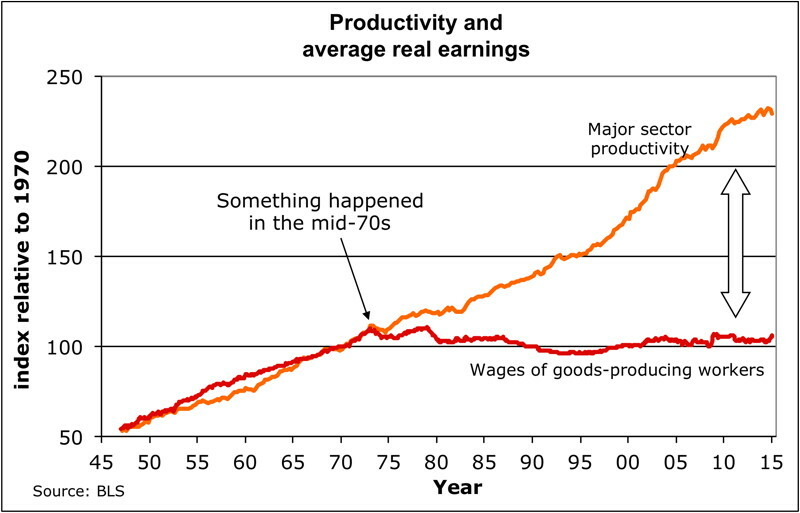 Economics does not explain what happened in the mid-70s. It was not the oil shock. Not interest rates. Not the Fed, or monetary policy. Not robots, or the decline of the Soviet Union, or globalization, or the internet. The sharp break in the mid-70’s marks a shift in our country’s values. Our moral, social, political and economic values changed in the mid-70’s. The author is exactly right regarding “X” and exactly wrong in getting cause and effect backwards. At “X” Marks the Spot, he notes “[s]omething happened,” and the wages of goods-producing workers flatlined, never to recover. He is right and perceptive in this too little appreciated fact. As it happens, “X” correlates with Nixon shutting down the Bretton Woods gold standard in 1971 and the epic failure to get it fixed and restored in 1973. The drag, after a modest lag, filtered into the working economy. The rest is persistent stagnation for median families. It was the destruction of the (dilute) gold standard which precipitated the death, or at least long coma, of the American Dream. That, in turn, caused the ensuing degradation “in our moral, social, political and economic values” as America turned Hobbesian. ALTHOUGH THERE ARE COUNTLESS MALADIES that are forever causing the decline of kingdoms, princedoms, and republics, the following four (in my judgment) are the most serious: civil discord, a high death rate, sterility of the soil, and the debasement of coinage. The first three are so obvious that everybody recognizes the damage they cause; but the fourth one, which has to do with money, is noticed by only a few very thoughtful people, since it does not operate all at once and at a single blow, but gradually overthrows governments, and in a hidden, insidious way. The GOP is beginning to come around to the gold standard. The academic (though not the ethnic or labor) left remains resistant. Getting the gold standard wrong could be catastrophic. In getting the gold standard back in place the right way — a way that will be at least, and preferably more, beneficial to labor than to capital — it would be invaluable for the left to begin to come to terms with the crucial role the gold standard played, and again can play, in restoring a climate of equitable prosperity. Therefore, I respectfully ask that progressives open their hearts to exploring the possibility, just the possibility, that the gold standard would go a long way toward restoring both economic prosperity and economic justice for all — the American Dream. America, and the world, greatly would benefit from participation from the Donks in making sure that the Pachyderms don’t do a wrongheaded pro-Ebeneezer Scrooge version of the gold standard. If we get this right, afterward there still will be much to argue about. We can have merry and spirited arguments as to whether all the extra tax money pouring in from all those new great jobs and businesses should be spent on family leave or abolishing the estate tax. The thing is… if we get the gold standard right there will be plenty of money to do both. And more. According to a grounded assessment I made a few years ago at Forbes.com there’s probably at least $6 trillion (with a T!) of new federal tax revenues hidden in there, without raising tax rates. Visualize federal surpluses! And there will be maybe 10X that for the private economy. Win-win! Putting that gold — and yes, Uncle Sam has plenty of it, the most, by far, in the world — back to work in the right kind of way is highly likely, perhaps even certain, to restore wage growth, end privilege-based inequitable income inequality, and restore our moral, social, political and economic values like nothing else possibly could. This isn’t partisan. Historically, progressive Democrats like Grover Cleveland were as committed to gold as were Republicans like William McKinley. The left is invited to participate. So, my progressive friends, let’s grab our shovels, and let’s dig together. “X” marks the spot. The Subprime Mortgage Is Back: It’s 2008 All Over Again!